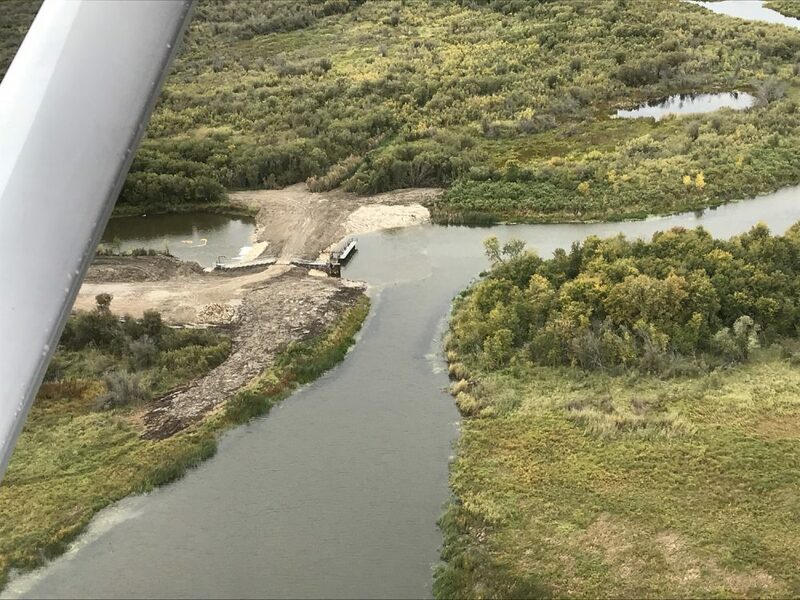 It’s mid-August and the fifth week of construction for the new South Reader Outlet dam near The Pas, the most complex and expensive project in recent years for Ducks Unlimited Canada in Manitoba. The weather has been fair, the contractors have pushed hard through 12-hour days, and there have been no major problems. DUC engineer Parsa Aminian is confident the work will be done by mid-September. “Most of the difficult work is behind us with no issues,” Aminian says. That’s good news for a big DUC project that has even bigger implications for an expanse of world-renowned waterfowl habitat. The $1.5 million rebuild of the dam will help maintain 260,000 acres (105,218 hectares) of wildlife habitat in a river delta known for its fishing, hunting, trapping and tourism. “It’s definitely not run of the mill,” Aminian says. Large DUC wetland projects are usually made up of smaller structures that are linked, whereas the South Reader Control Outlet is a single structure. The new water control will replace one that spans Whitefish Creek in the boreal forest, about 10 kilometres northwest of The Pas on Crown land, and controls water that flows from Reader Lake to the Saskatchewan River. The Saskatchewan River Delta is one of the largest freshwater deltas in the word, and internationally recognized as important waterfowl habitat. Rebuilding the control will help conserve that important habitat, and protect the economy and culture of indigenous people who rely on the trapping, hunting and tourism that the delta provides. Half of the old dam was built in 1958, and the second half in 1976. Water flow through its eight-foot-diametre pipes was controlled by stop logs placed at their openings. Under agreements with Manitoba Conservation and Water Stewardship, DUC used the dam to maintain water levels in shallow marsh wetland for waterfowl and other wildlife such as moose. South Reader is the only outlet for a series of eight wetlands known as the Reader-Root Complex. They and the surrounding habitat were protected, in part, to offset habitat losses in the area due to hydro-electric development. After 60 years, however, the steel pipes of the old control were badly corroded. Replacing it was critical to maintain historic water levels. The control stands beside the Opaskwayak Cree Nation (OCN) and DUC kept residents there up to date on its plans for the new structure. Once complete, the dam will provide a safe way to cross the creek and access traditional territory. Partly funded by Wildlife Habitat Canada, the direct and material costs for the rebuild total more than $1.5 million. In addition, DUC has budgeted for long term operating costs. The new dam, which like the old structure will control the flow of water using stop logs, is an upgrade that’s more resilient than the one it replaces. “The new one is much more efficient in design,” Aminian says. The old dam’s four eight-foot-diametre pipes will be replaced by four high-density polyethylene pipes that are narrower at four feet in diametre, but smoother and more efficient. The new 30-metre-long pipes will allow the same rate of water flow as the old ones. They’re also thicker and won’t rust, like the old corrugated steel pipes did. Perhaps one of the new dam’s most exciting features is a fish ladder that wasn’t part of the old structure. Fish will be able to swim upstream past the dam in stages: at each level the structure creates an eddy where they can rest before pushing to the next step. DUC has built fish ladders in other parts of the country before, but they’re still rare for the organization. 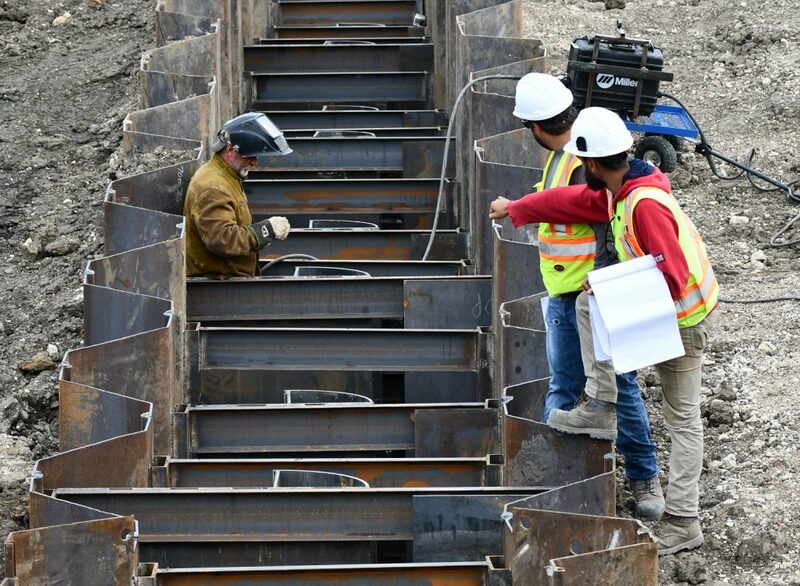 The complexity of the project demands a contractor that can quickly handle a variety of challenges, such as welding and moving earth near water and aquatic species. Heavy equipment was used to shift 400,000 cubic metres earth and more than 90,000 kilograms of steel, but the job also demands precision. For the fish ladder, for example, excavators lowered heavy steel plates that had to be welded in place 25 cm apart, plus or minus half a centimetre. The contract workers have been accurate to within two millimetres. “They’ve been bang on for everything, and moving 874 kilos with precision,” Aminian says. The project foreman has some experience working with DUC. Dwayne Sigfusson figures he’s worked on 30 or more projects for DUC, mostly while working for his grandfather and father’s company, Sigfusson Northern. The South Reader Outlet control is the first project for his son’s company, BT&T Construction. Road construction, sewer and water installation, excavation, lagoon and dike building – the company has handled all of that. This is its first fish ladder though. “It’s not like an Ikea kind of furniture, where you get the parts and put it together,” Aminian says. As of mid-August, there was still a lot of work to do – the fishway had to be lined with gravel, the two remaining old pipes had to be removed and that section of the dam rebuilt, rocks put in place to prevent the dam from eroding, and walkways and a chain-link fence put in place for safety. The dam is working properly and holding the adjacent marsh to the correct level. “I think what they’ve built will last quite some time and serve our needs well,” Aminian said. The South Reader Outlet Control project was made possible with a funding contribution by Wildlife Habitat Canada. Who benefits from the project? Opaskwayak Cree Nation (OCN)—Conservation of 116,727 acres of habitat within OCN Traditional Territory. Citizens of the Rural Municipality of Kelsey and Town of The Pas—Conservation of 116,727 acres of habitat adjacent to RM Boundary which provides water filtration, carbon sequestration, and drought/flood attenuation in addition to recreational, economical and tourism opportunities. Waterfowl Hunters—Conservation of 116,727 acres of wetland and associated upland which is publically accessible waterfowl habitat. Become a DUC member today to pledge your support for abundant wildlife habitat, cleaner water and a healthy environment. 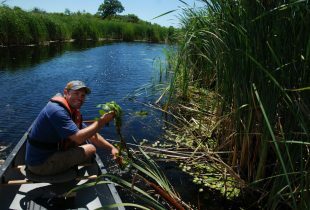 Control and monitoring disrupt the seed cycle in Eastern Lake Ontario and the Rideau River. 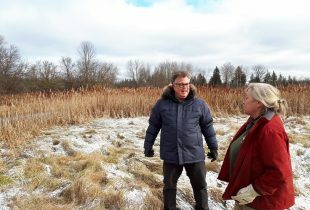 Restored habitat flourishes at family farm near Ontario’s busiest highways.